Gather around and enjoy the warm, sugary goodness of a State Fair classic with help from this adorable Sunbeam donut maker. 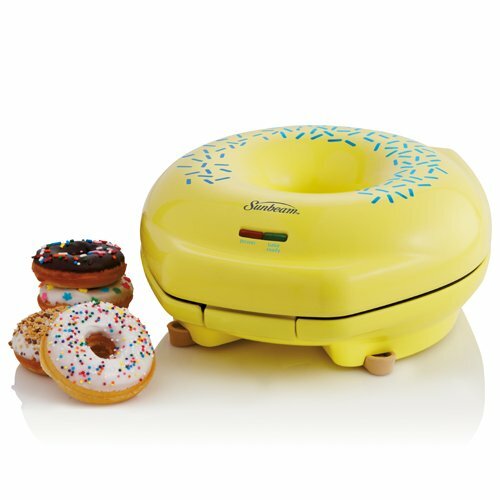 Shaped like an oversized version of the delicious treat, complete with rounded lid, center cutout, and printed "sprinkles", the delightful appliance quickly creates up to five donuts in a matter of minutes - no more messes and added fat from deep fryers or pots of oil on the stove to contend with. Furthermore, its nonstick cooking surface easily releases the completed baked goods and cleans up effortlessly when through. To use, simply power on the unit and wait for its "warm-up" and "bake ready" indicator lights to illuminate. Fill the donut-shaped molds with batter, secure the hinged lid, and carefully remove the desserts to a rack to cool after baking. Then the decorating fun begins, with topping options ranging from frosting and powdered sugar to sprinkles, chocolate drizzles, and more - just let creativity be the guide. While the unit offers too much fun to pack away for long, its latching lid allows for space-saving upright storage in a cupboard, pantry, or drawer when not in use.